Ten-minute walk to the subway satation (CORNELIA station – see the red “M” towards the map’s upper right), that takes you to the Vatican in 10 minutes (OTTAVIANO station), or to the city center in 20 minutes (PIAZZA SPAGNA, BARBERINI, etc. stations). The swimming pool you see in the map does not belong to us! But yes, the tennis court, basketball court and some ample space with trees. * BY BUS: you may try this bus service. 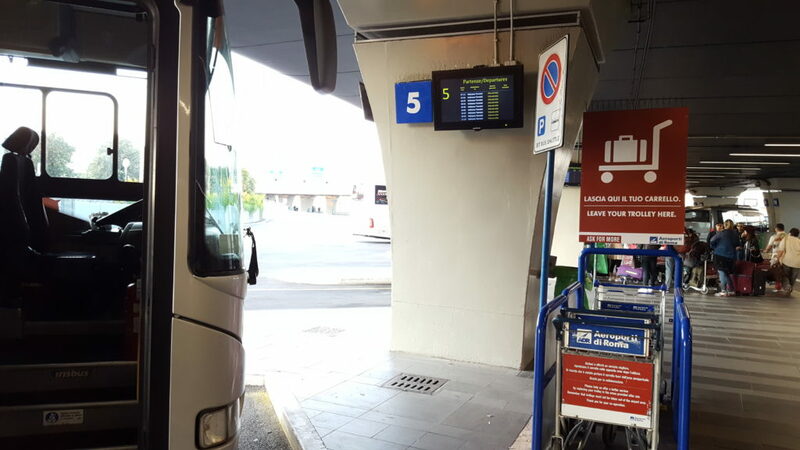 Click on “From Fiumicino Airport TO Rome city center”, and look at the second and third columns: Fiumicino APT to Circonvallazione Aurelia (which is the first stop, a 10-minute walk to the Collegio). To return to the airport, click on “From Rome city center TO Fiumicino Airport”. > The bus going near the Collegio picks up passengers from one of the platforms, usually no. 5. The display monitor gives the platform number (for example, “5”), then the time, then “Vaticano Termini” (or something similar), and “Sitbusshuttle”. To be sure, ask the “Sitbusshuttle” driver or the one selling tickets if it stops near Via Aurelia. Fare is around 6 Euros, travel time is some 30-45 minutes. > They might require you to put even handcarry bags into the luggage compartment under the passenger floor, accessible from big doors from outside the bus, along with the big bags. Make sure you pull out all your documents, money, cameras, tablets, computers and other valuable items before depositing the bags. > follow the signs to USCITA 1 (see signs saying Vatican City, Via Aurelia, SS1 Aurelio, etc.). Note that USCITA 1 comes after USCITA 33, which is the last exit (“uscita” means “exit”). * BY TRAIN: at the airport, follow directions to Rome city center’s TERMINI STATION. Fare is around 16 Euros, travel time is some 30 minutes, and there are trains every 30 minutes or so. Then, see below how to reach the Collegio from Termini station. * Take the Metro (subway) going to the CORNELIA STATION. * NOTE: DO NOT get off the “Valle Aurelia” station! We are NOT at Valle Aurelia, but at Via Aurelia. “Valle” means “valley”, while “Via” means “street” or “way”. So don’t get off the subway while still in the valley, otherwise you’ll have to walk up the hill! Many confuse this, so please take note: get off the metro at CORNELIA STATION, not Valle Aurelia station. * Then, see below how to reach the Collegio from Cornelia station. * go up the stairs one floor; alternatively, there is an elevator if you need one, though it is a bit hidden from view (just follow some people who do not go up the stairs with the main flow, as they might probably be using the elevator). Whether you take the stairs or elevator, you will end up going through a revolving exit barrier (waist-high). * after the barrier, if you do not need the elevator: turn left, and go up three sets of escalators. At the top, there will be a fork. Take the right flight of stairs to reach the street level, and continue walking to the bus stop, just before McDonald’s. * after the barrier, if you need the elevator: go straight ahead to get to the next elevator. Press the topmost button, to exit at the street level. Go right, and continue walking to the bus stop, just before McDonald’s. * You may take bus number 246, using the same ticket you used for the subway (in such a case, you do not need to punch the ticket in the bus). The bus will turn right at McDonalds, entering Via Aurelia. * Or you may decide to walk some 10 minutes: go to McDonald’s at the corner and turn right to Via Aurelia. > Some convenience stores, mini-markets, cafe’s, etc. > Two sets of stop lights, with nearby signs saying Comune di Roma, Municipale, Polizia, etc. (those are the Municipal office and police station for the neighborhood). > La Salle Brothers. They have a small gate by a bus stop, then after a bit of fence, their main big gate. > The first gasoline station. (Across Via Aurelia at this point you will see Scuola Ufficiali Carabinieri – the School for officers of the Carabinieri – that’s the military arm also used for civilian purposes). If you’re on the bus, press the stop button now, to get off the next bus stop (the bus stop is right at the end of the Collegio compound, so you will need to walk back a bit to reach the Collegio gate). > After the gasoline station, you will see signs to Parco Tirreno Hotel. Do not enter this side road! The Collegio compound is right after the hotel signs. * Welcome to the brown gate with grills, at no. 490. Stop and ring the bell. If no one answers, call +39 06 6604 1602 during office hours, or our celfones outside office hours. If you don’t have our celfones, keep on patiently pressing the gate’s doorbell button (read: please let us know a day or so ahead the approximate time you plan to reach the Collegio, so we can wait for you; but not too late please).